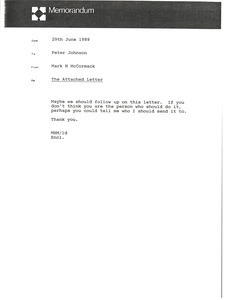 Communication regarding Martina playing one-nighters. 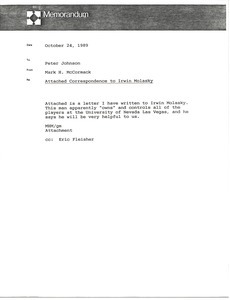 Bob Kain worries that it might this might be a problem due to IMG's relationship with the USTA. 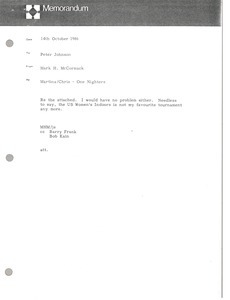 Barry Frank and McCormack do not find it to be a problem. 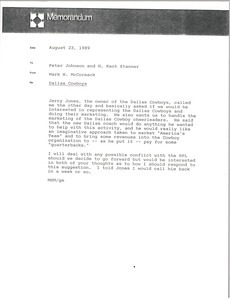 Concerning Jerry Jones, owner of the Dallas Cowboys, asking if IMG would represent the Cowboys. 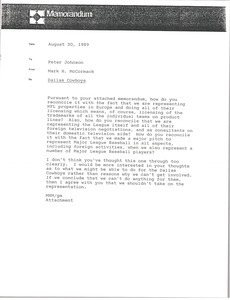 In response to Johnson's memorandum about the conflict that prevents IMG from entering into a marketing agreement with the Dallas Cowboys, McCormack lists some other supposed conflicts within IMG's representation in the world of sports, and asks Johnson to think through the possibilities with the Cowboys. 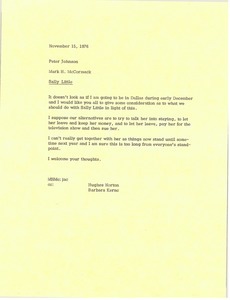 Concerning following up on the attached letter from John Querio, suggesting a women bowler client. 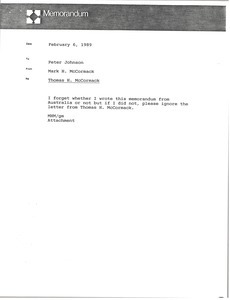 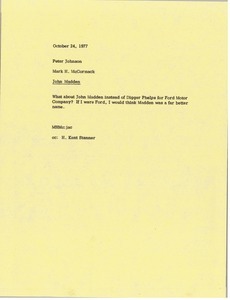 McCormack tells Johnson to ignore the letter from Thomas H. McCormack, an alleged relative of Mark McCormack's whose "forte is playing basketball on roller skates." 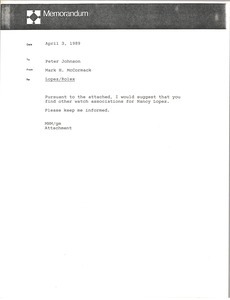 Concerning the attached regarding Nancy Lopez's agreement with Rolex and Johnson's suggestion to terminate this relationship, McCormack suggests finding another watch association for Lopez. 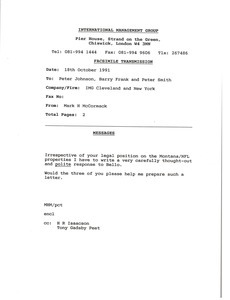 Concerning the attached letter that McCormack has written to Irwin Molasky.